Escape Clause already has accomplished something that escapes most horses: winning 19 races, done in a career of 28 starts. 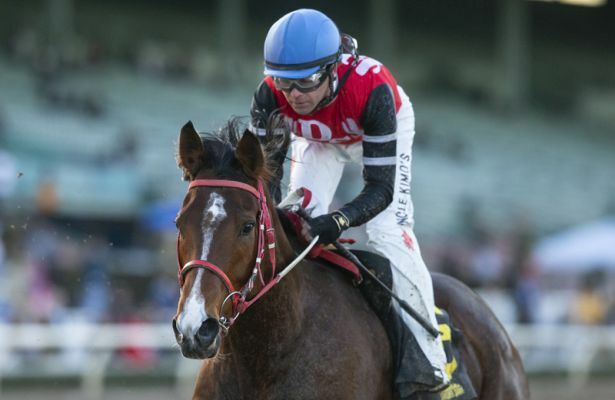 The 5-year-old mare bred in Manitoba, Canada, captured Saturday’s Grade 3 La Canada Stakes by 5 ½ lengths under Tyler Baze for owner/trainer Don Schnell and thus cemented her standing as one of the biggest Cinderella Stories in recent years. By Going Commando and out of Danger Pay, Escape Clause is believed to be the first Manitoba-bred stakes winner in Santa Anita history. She covered a mile and one sixteenth on a wet-fast track in 1:41.89. “She came out of the race great and we’re looking to run here in either the Buena Vista or the Beholder Mile,” Schnell said Sunday. The Buena Vista is a Grade 2, $200,000 event at a mile on turf Feb. 23, while the Beholder is a Grade 1 on the main track worth $400,000 March 16. “We want to run her back here at Santa Anita,” Schnell added, “we’ll just have to figure out which race. With the $60,000 earned in the La Canada, her first graded stakes win, Escape Clause increased her career earnings to $423,500. On Monday, Jan. 21, Martin Luther King Jr. Day, Santa Anita’s feature race is the Grade 3, $100,000 Megahertz Stakes, named for the diminutive dynamo known for winning stakes in dramatic style, coming from absolutely last to overtake her rivals at the finish. From Jan. 9, 2002 through her last race, on Oct. 29, 2005, Alex Solis rode the chestnut daughter of Pivotal in 21 of her 26 starts in the United States, winning 11. In each of those 26 starts, none shorter than one mile and none longer than 1 3/16 miles, the earliest Megahertz ever made the lead was when the field turned into the stretch. A Hall of Fame jockey and current member of the California Horse Racing Board, Solis, who turns 55 on March 25, understandably had fond memories of the multiple Grade 1 winner, who won 14 of 34 starts and earned $2,261,594. She was second six times and third five times. Megahertz was bred in England by Cheveley Park Stud and trained in the United States by the late Bobby Frankel. “She was a little tiny horse owned by my friend Mike Bello that had an incredible kick,” Solis recalled, a smile beaming on his face. The California Thoroughbred Breeders Association will conduct a Winter Mixed Sale this Wednesday, Jan. 16, beginning at noon PT in the Hinds Pavilion at Fairplex Park. Horsemen are advised that CTBA Winter Mixed Sale catalogues are available in the Santa Anita racing office and at ctba.com. For additional information, prospective buyers are encouraged to visit the CTBA website, or contact Loretta Veiga at (800) 573-2822, ext. 227 or via email at loretta@ctba.com. An additional Sale contact is Christy Chapman, at (800) 573-2822, ext. 247 or via email at christy@ctba.com. The main office number for the CTBA, located just across the street from Santa Anita on Colorado Place, is (626) 445-7800. FINISH LINES: With rain forecast Monday evening and off and on into Thursday, training could be dicey for the upcoming week, but currently Jerry Hollendorfer plans to enter Awesome Anywhere (Mike Smith) and Kanthaka (Flavien Prat) in Saturday’s Grade 2 Palos Verdes Stakes for older horses at six furlongs. Prat also would ride Vasilika for Hollendorfer in the Megahertz at a mile on turf Monday, Jan. 21, Martin Luther King Jr. Day. Joe Talamo has the mount on Last Promise Kept for Tom Proctor in the holiday race. Having withdrawn his appeal of a suspension issued last Sept.29, jockey Drayden Van Dyke will serve a three-day ban Jan. 19, 20 and 21. Santa Anita is dark for live racing Monday, Tuesday and Wednesday. Live racing resumes 1 p.m. Thursday, Jan. 17. There is simulcast racing Wednesday with free general admission and parking. Admission gates open at 10 a.m.